A writer just said to me that she gets halfway through a story and it dies. She loses interest and doesn’t finish it. I’ve heard lots of people mention that it’s easy to start and hard to finish, so just what is happening when stories die? And how can you get beyond that point and actually finish? Let’s begin with a simple premise: a story is bad things happening to interesting people. Here’s another simple premise: a story is made up of three things—character, plot, and setting. When a story derails midway, the plot, the character, or both have gone wrong. Let’s use an example to work through this common writing problem. I’ll give you a tool to make sure your stories don’t die. Suppose Tim is mugged in a parking lot, but instead of taking his cash and running, the bad guys make him climb into his trunk and lock him in. That’s a good scenario. I don’t know anything about Tim at this point, but I’m worried for him because he’s put in harm’s way and there are clear bad guys in the scenario. I could write a story about this. Everyone would be interested to see how it ends. Now, suppose I like Tim. He’s a good character and this is the middle of the book, so both I and the readers know Tim has to get out of the trunk alive. I want Tim to understand that life is precious and could be taken away any time, so he should be a better husband and father. Did you just yawn? Why? Appreciating life is a great theme. It’s universal. We should all aspire to it, right? Sure, but the story just stalled. Did you hear it sputter and halt? Why? Well, Tim is an average guy who should be a better person. That’s how the character killed the story—Tim is just an average guy with a universal goal. And we know he’s going to be fine. And that’s how the plot killed the story—if we know he’ll be fine, there’s nothing at stake. So how do we get out of this fix? The same way we got into it: imagine new things until we get excited. It was exciting to imagine the bad guys forcing Tim into the trunk. We could feel Tim’s heart pounding against his ribs. He’s wishing he’d bought the hatchback instead of the sedan right now, and so are we. Imagine that the bad guys run away and within a half hour, someone hears him yelling and he’s rescued. That would make a great anecdote to tell his wife when he gets home. In real life, that would be harrowing. But why would that be harrowing in real life and not in a story? That is how we make real life scarier than it actually is. If Tim said, “I was mugged and locked in the trunk, then released and now I’m just fine.” That would all be true. His wife could say, “How nice dear. At least your day wasn’t boring.” Also true. But it makes for a poor story. Our stories die when we think we’ve run out of Hypotheticals. We get stuck thinking that if we need Tim to be fine, then there’s not that much we can do with this scenario. And if that’s the case, the story is dead. Might as well move on to the next great story idea. Wrong. Wrong. Wrong. Lots can happen between the mugging and Tim getting on with his life. We’re going to play The Hypothetical Game. *You can click on the pictures to enlarge them. 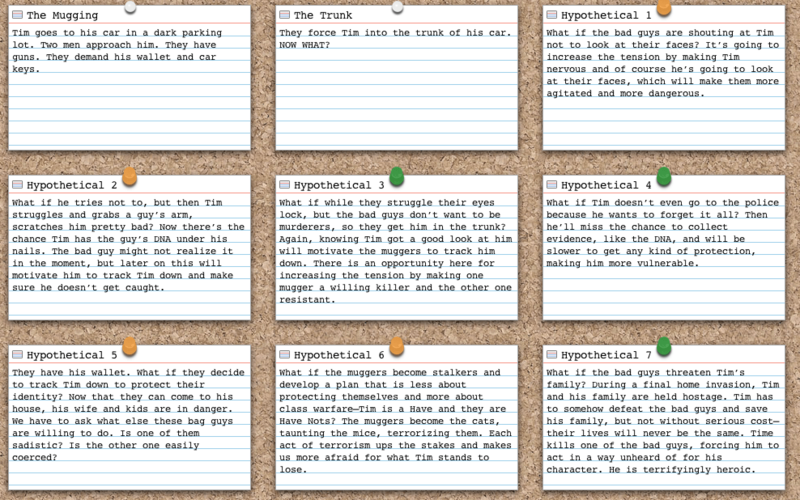 Write out all of your Hypotheticals on index cards and move them around, re-order, mix and match. What if the bad guys are shouting at Tim not to look at their faces? What if he tries not to, but then Tim struggles and grabs a guy’s arm, scratching him pretty bad? What if while they struggle their eyes lock, but what if the bad guys don’t want to be murderers, so they get him in the trunk? What if they worry about being identified by Tim? They have his wallet. What if they decide to track Tim down to protect their identity? What if Tim doesn’t even go to the police because he wants to forget it all? Now something more interesting is shaping up. A cat and mouse game is developing between the muggers-turned-stalkers and Tim. Now we have something more at stake: the mugging isn’t over, it’s continuing as the bad guys decide to track Tim down and take care of him. They have his address, so now his wife and kids are in danger. Tim didn’t stand up to them in the parking lot, but he’s going to have to sooner or later to save his family. Each of these Hypotheticals advances the action of the story, increases the risk to Tim and his family, and thereby increases the stakes. Every time the stakes go up, we save the plot. Average-guy-Tim is now forced to be exceptional. He’s going to have to call on or develop some survival skills and fast! And if our original thought was that Tim should appreciate life and be a better person, now that he’s in a position to protect his family from the bad guys, that message is coming home in a dramatic way. Every time we let Tim be extraordinary, we save the character. Go back to those cards with the Hypotheticals written on them. Answer the questions. 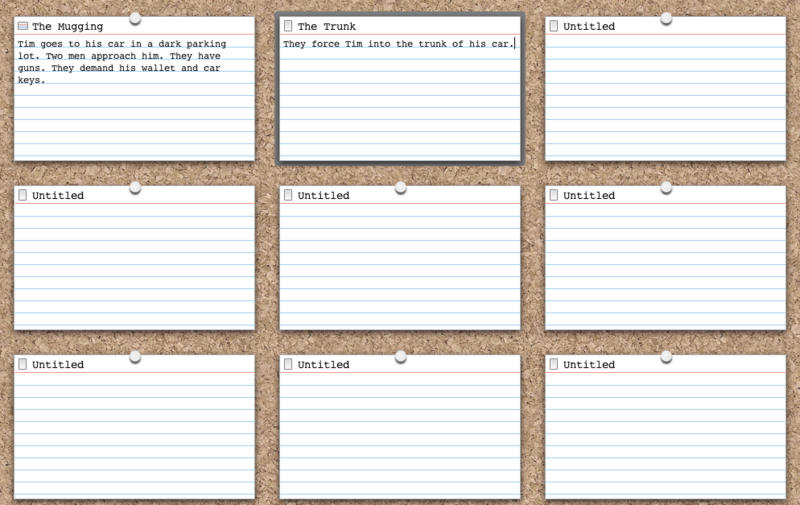 Also, as you go through, toss out cards that are redundant and add new Hypotheticals that further up the stakes. As you address each Hypothetical, your ideas will continue to develop. You will find new avenues to explore. For instance, on card #7, Tim has to kill one of the bad guys to save his family. This is an act completely out of character that will profoundly impact his psyche, traumatize his family, and change all of their lives. While he is acting in self-defense and is a hero, he is also terrifying. 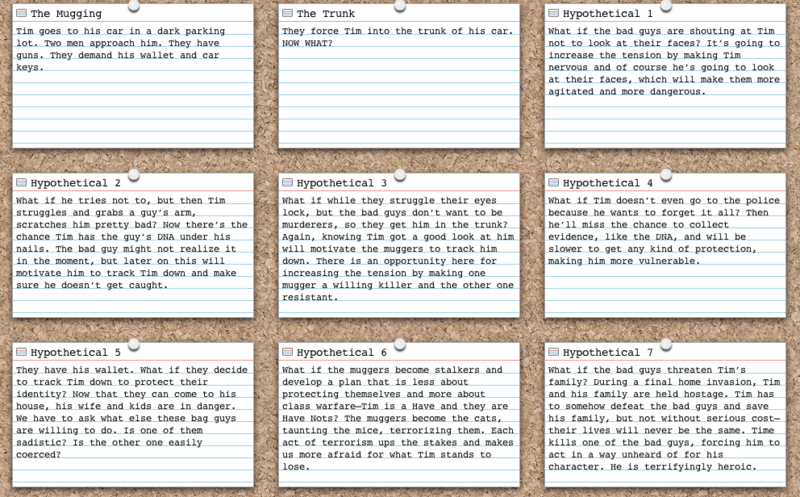 A new set of Hypotheticals will have to be developed in order discover the best situation (action/reaction) for Tim to fulfill this climax of killing a bad guy and saving his family. There’s one more step to The Hypothetical Game. 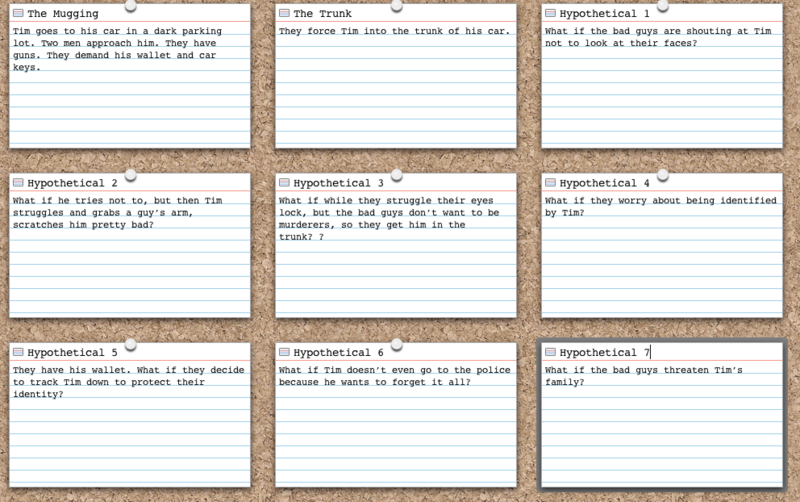 Because stories die from both plot and character issues, go through the cards and color code them. Orange for plot. Green for character. Of course, some Hypotheticals serve both plot and character, but you want to make sure that as you write forward you are developing both plot and character. The action rises and the character develops. If your cards are mostly orange or mostly green, even them out. Ask yourself how this action affects the character involved, or what kind of action this character development would enable. Now that you’ve got your Hypotheticals written out, you can finish that book. Each step card marks a point in the action and/or character development that will keep you interested in your story now, and engage your readers later. One of the reasons stories die midway, is because we start thinking about them like real life. But people don’t read stories to engage with real life, people read to escape real life. Grab your index cards. Be extraordinary! Love this! Thank you, Alida for sharing your wisdom and a practical and doable strategy to save my story! I’m bookmarking this for future reference! Thanks for reading, Wendy. Write on!